In 1973, after Billie Jean King said that “the unequal pay situation stinks,” the top female tennis players at the U.S. Open got the same prize money as the men. But it was not because of the people who ran the tournament. Ban Deodorant said it would make up the difference. Now, 43 years later at Rio 2016, the women still are not treated equally. 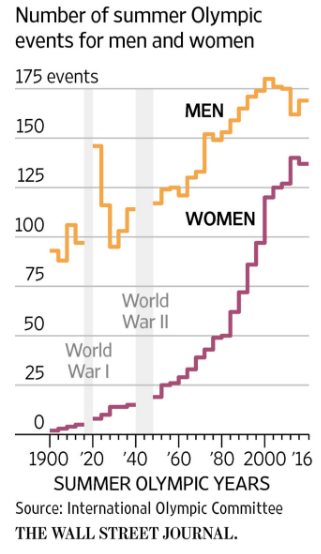 At Rio 2016, the female athletes can participate in 137 events while the men have 169. Consequently, women cannot possibly win as many medals. However, asked about why we have not reached 50/50, the IOC (International Olympic Committee) reminds us that new events will be gender equal. 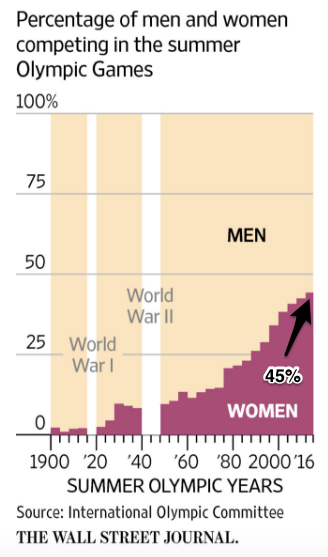 Doing the math though, you see that gender equal additions mean the percent chance for women to win medals climbs ever so slowly, destined never to be the same as the men. Furthermore, there are more men-only events than women’s (just rhythmic gymnastics and synchronized swimming). And, making it still worse, many events have a lower quota of female athletes. Just look at football (soccer) with 16 men’s teams and 12 for the women or that the men’s Olympic ice hockey team has 25 men and the women can have no more than 21. Too often, Olympic rules perpetuate outdated assumptions about female frailty. The 50 km race is exclusively male and for cross country and downhill skiing, wherever there is a difference between men and women, the female race is shorter. During the London Olympics, the women’s water polo team competed in a smaller pool than the men. I assume it is the same in Rio. We also will only see male swimmers do a 1,500 meter race and in cycling, the men’s race is 250k while for the women, 140k! We could go on, but you see that women have unequal opportunity at the Olympics. Olympiad inequities take us to developing female human capital to its fullest and an expectations bias that could be a self-fulfilling prophecy. However, my primary concern is money. Whenever female athletes are relegated to a lower rung, the bias explicitly and implicitly reinforces lower pay. 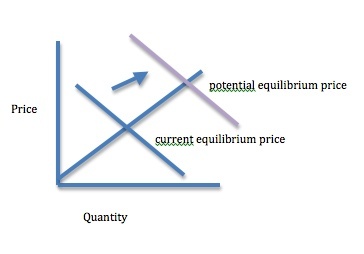 In labor markets for female athletes, equilibrium pay is far below the men. To shift the demand curve, we need the synergy that more media, consumer and commercial appeal will create. And let’s applaud Billie Jean King. My sources and more: I was delighted that WSJ called attention to gender inequity at the Olympics in a front page article. Looking for additional data, I discovered a gender audit from the Centre for Sport Policy Studies at the University of Toronto and a reminder of the role played by Billie Jean King. Previous ArticleIs Happiness a Good Reason to Host the Olympics?